Kernel and u-boot are currently WIP. The "UBOOT" button triggers FEL mode. It is located between UART and the microSD slot. FEL mode is currently not too useful due to the lack of a standard OTG port, but perhaps a special USB Type-A (male-male) cable could work. 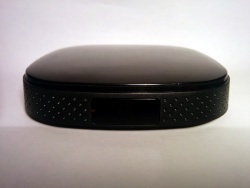 The top lid (shiny part) is held only by plastic notches. Insert your Plastic tool between top and bottom case vertically, and carefully work your way round. RX, TX and GND are clearly marked on the board right next to the microSD slot. 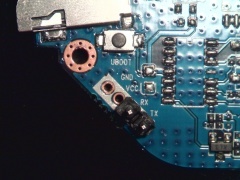 Just solder on some wires according to our UART howto, or you can solder in some 2.54mm pitch connectors like in the picture. This page was last modified on 27 November 2014, at 16:20.